I thought, Well, I'm freezing, but I'll just have one more poke at getting a rabbit and then I'll call it a night. 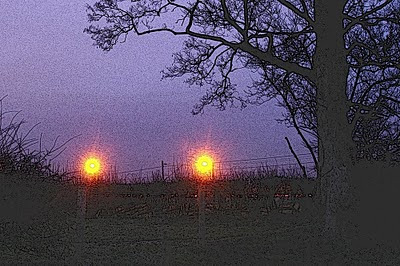 So I started to walk down the field to a corner I know where I stood a good chance of at least - with the aid of a nearby street lamp - seeing an early-evening rabbit. As I was on the way there, though, the wind got up and I realised that it would be blowing straight over me and towards the burrows - clearly no good. So I doubled back, hopped over a fence, nipped across the same field from which I expected the rabbits to emerge, walked down the line of the fence a little way until I was at - what I estimated - was about thirty yards from where I thought they might emerge. I clambered through the fence (with, I expect, a noticeable absence of cat-like grace) and then flopped down and stuck the end of the rifle barrel through the fence. After all this palaver, I thought, I'll be lucky to see anything - but at least the wind was now blowing into my face. A couple of minutes later - rather unexpectedly, given my clumping across the same field a little while before - a rabbit emerged, roughly from where I expected, and then dashed some distance away from me and sat down. So then I set about to trying to figure out how far it was away from me. Is it thirty yards? No, it's more than that. Is it forty yards. Well, yes, maybe - it could be forty yards. I knew that the fence across the field from me was thirty yards away because I'd walked it in the past so I mentally picked up the distance from where I was lying to the fence and plonked, it in my imagination, across the distance between myself and the rabbit to see how much was left over. Well, maybe it is an extra ten yards on top of the thirty, maybe it is forty yards? Forty yards is pushing it for an accurate shot for me so I lay there and looked at the rabbit for a while in the hope that it would hop a bit closer to me. Ten minutes passed and I was getting colder - the rabbit stayed motionless. Take a forty yards shot? Well, if it's a head shot and it misses, then there's a good chance it'll just be a clear miss and the rabbit will scarper unharmed - and having a go, at least, seems much less depressing that just getting up and going home. I moved the scope so that the forty yard points in the reticule were over the rabbit's head - but the reticule was too brightly illuminated and I couldn't see the rabbit any more beyond the glow of the cross hairs. So I tried to dial down the stiff brightness adjuster - only the batteries choose this moment to start to run out and the reticule started to flicker alarmingly on and off like the lighting in a horror movie. I twiddled more with the adjuster and it stabilised a little; I found the forty yard point in the reticule, steadied the image of the rabbit in the scope, squeezed off the shot - and watched the rabbit run back to its burrow unharmed. I walked the distance across the field to see how far the shot had really been: fifty yards. Not forty, fifty - and fifty is too far for me to stand a chance of getting an accurate head shot. If I'd known it was fifty I wouldn't have taken the shot - but, thinking about it - even forty is too far for me. I suppose I need to stick to shots that I know I've got a chance of landing - that's to say at between between twenty and thirty five yards. But it's difficult to estimate distance and it's difficult, also, to look through a good, clear scope at a rabbit that you put can put right between the cross hairs and not take the shot - because even though it looks close, it's not. Reading this entry I can't help wondering, where do the stray shots go? What if this blog catches on and we're all at it, stumbling around the fields, missing rabbits and shooting one another! I do like your concern for the rabbit. It reminds me of D.H. Laurence: if you love me, you hate me. Wishing you and the next rabbit well, JB.